The EU will hold its annual human rights dialogue with Azerbaijan’s government in Brussels on 17 October 2017. International Partnership for Human Rights (IPHR) urges the EU to use this dialogue to prominently raise concerns about the repressive civil society environment in Azerbaijan and to seek tangible results in the form of commitments to improvements from its government. A briefing paper prepared by IPHR for the dialogue, based on information from Azerbaijani partners, draws attention to current alarming trends regarding freedom of association, peaceful assembly and expression in the South Caucasus country. These trends have also been criticized by international human rights bodies, including the UN Human Rights Committee in its conclusions from November 2016 and the UN Special Rapporteur on the situation of human rights defenders in the report on his September 2016 mission to Azerbaijan. On 11 October 2017, the Parliamentary Assembly of the Council of Europe (PACE) adopted two strongly worded resolutions on Azerbaijan, regretting the current pattern of violations of fundamental freedoms, the lack of independence of the judiciary and the lack of progress on implementing judgments of the European Court of Human Rights (see resolutions 2184 (2017) and 2185 (2017)). The work of independent NGOs remains seriously curtailed in Azerbaijan because of cumbersome and discretionary registration procedures; far-reaching restrictions on accessing foreign funding; excessive state control and reporting obligations; harsh penalties for violations; and broad grounds for suspending and closing down NGOs. Spurious criminal investigations against NGOs remain under way and the accounts of numerous groups remain blocked, as a result of which they cannot carry out their work. Police frequently disperse and suppress peaceful protests using excessive force, and detain and bring participants to justice for alleged violations. Ahead of the peaceful anti-corruption rally held in Baku on 23 September 2017, over 60 opposition activists were summoned, warned and detained, with part of them fined or sentenced to up to 15 days’ arrest. Police also used facial recognition cameras to monitor and intimidate rally participants. The Azerbaijani authorities have taken systematic measures to silence opposition and independent media. Most recently, they launched a tax evasion investigation against the Turan News Agency, raided its office and froze its accounts, forcing it to suspend its activities. Other independent media outlets have already previously been forced to halt their in-county operations and work from abroad. In May 2017, the websites of several independent news outlets, including the Azerbaijani service of Radio Free Europe/Radio Liberty, the Azadliq newspaper and Meydan TV were blocked for allegedly posting information threatening national security. The Azerbaijani authorities continue their relentless crackdown on journalists, bloggers, human rights defenders, civil society activists and other critical voices, arresting and imprisoning them on politically motivated grounds. While a number of individuals have been released thanks to international pressure, many others remain behind bars and new arrests have been carried out. Those released have typically not had their convictions overturned and some of them are subject to travel bans. Others have been forced into exile. Following the opening of the tax evasion investigation against Turan, its director Mehman Aliyev was arrested on corresponding charges and held in pre-trial detention for two weeks until placed under house arrest on 25 August 2017. The investigation against him continues. Well-known blogger Mehman Huseynov was sentenced to two years in prison on charges of defaming police in May 2017 after exposing police abuse and remains behind bars. Journalist Afgan Mukhtarli was abducted in Georgia in May 2017, only to resurface in Azerbaijani custody, where he has since been held on illegal border crossing and other bogus charges. On 14 October 2017, Fikret Huseynli – an opposition journalist who was granted asylum in the Netherlands in 2008 and citizenship in 2015 – was detained at Kyiv airport based on an Interpol request by Azerbaijan. If returned to Azerbaijan, he would be likely to face unfair and politically motivated proceedings and imprisonment. In a particularly deplorable case, the Azerbaijani authorities have consistently failed to release opposition REAL movement leader Ilgar Mammadov, although the European Court of Human Rights ruled three years ago that he had been detained because of his criticism of the government. The Council of Europe’s Committee of Ministers recently launched an initiative to return his case to the Court because of the non-execution of the ruling, if there is no progress on ensuring his release by late October. 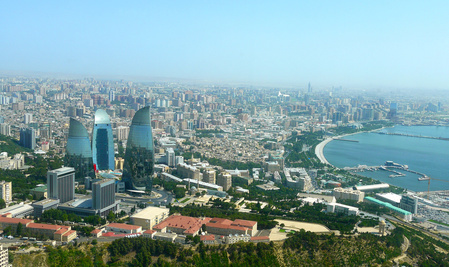 The cases mentioned above are only a few examples of individuals who have been detained in retaliation for their exercise of fundamental freedoms in Azerbaijan. According to the most recent report of the Azerbaijani civil society working group documenting cases of political prisoners, there are currently over 150 such prisoners in the country. Stop blocking the websites of independent media outlets. For more details on the concerns summarized above, as well as additional recommendations, see IPHR’s briefing paper for the EU-Azerbaijan Human Rights Dialogue.